SALE: Pearl and Rhinestone Headband in Rose Gold was $199.00 now $160.00 and Ready to Ship! Beautiful and very detailed! 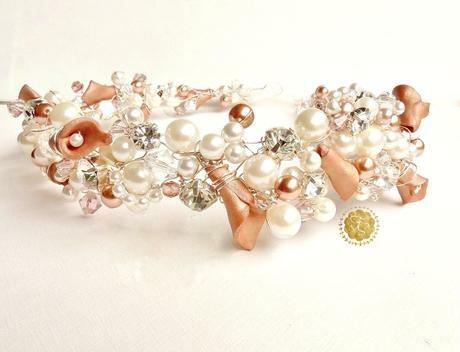 This rose gold and pearl headband features rose gold and ivory Swarovski pearls. Detailed with many sparkly Swarovski rhinestones and crystals. The rose gold calla lily flowers are hand shaped with clay. Every embellishment is hand wired with rose gold non tarnish wire. Flower crown can be worn with the ivory satin tie back or pinned in the hair. This is a very unique and one of a kind piece handmade in my studio. An amazing statement piece that is perfect paired with a wedding veil or worn alone. Shop for it here.